Gunnison’s description of early Mormon tongues bears a strong resemblance to the practice of modern Pentecostals. Since I grew up in that tradition, I thought our readers might be interested in hearing about my own experience of tongues as an adolescent. It perhaps gives a taste of early Mormon spirituality, though in important ways modern Pentecostals are very different. As a side note, the early Mormon practice of tongues was part of what originally got me investigating Mormon history. My church claimed to have restored the gift of tongues to the world in 1906 at the Azusa Street Revival. So to learn that Mormons had beaten us to the practice by more than 70 years both intrigued me and disturbed me. I wasn’t the only one being prayed for this night. The room was packed with pious youths and their adult leaders, gathered in groups around newbies like me. We had been taught that tongues was a miraculous sign that one had received the baptism of the Holy Spirit. If I didn’t receive it this night it wouldn’t be the end of the world. There would be other opportunities to be prayed for some other time. But my friend James had just received it, and others in the room were singing out triumphantly in the angelic language. Turning my eyes toward heaven, praying aloud with great zeal and tears in my eyes, I begged my Father for the heavenly gift. I had heard different accounts of what tongues felt like. Some said that they had felt it welling up inside them, others that they felt their mouths physically controlled by the Spirit. I experienced no such sensations this night, no such loss of control. It was terribly disheartening. Why was the Spirit ignoring me where it had spoken through so many others? A person close to me had shared with me a more mundane theory of what it means to speak in tongues. In Chapter 2 of the biblical Book of Acts, all the members of a multi-ethnic crowd miraculously understand the words of a single preacher. This person’s idea was that the miracle of tongues takes place in the ear of the hearer rather than in the mouth of the speaker. She suggested that when we speak in tongues, we speak nonsense sounds under our own power and God fills those sounds with meaning. That account of tongues never sat right with me. It seemed to me that tongues was supposed to be a real gift and a real miracle. The way this person explained it made it sound awfully unmiraculous. On this night, one of the adult leaders took me by the shoulders and gave much the same explanation of how tongues worked. Then he laid his palm on my forehead and told me to “just begin to speak out.” I had to make a decision to speak, he told me. It was me who had to do the speaking. I needed to let go of my fears and insecurities and just start babbling. I hesitated, but I did what he said. Awkward syllables tumbled from my lips, all of them consciously chosen and formulated in my mind beforehand. “Hallelujah,” my peers around me intoned sincerely. “Praise God. Thank you Jesus.” Everyone else in the group dispersed that night satisfied that God had showed up and bestowed upon me a miraculous gift. I wasn’t so sure. I went home that night and sat on the floor next to my bed and prayed and cried and prayed some more. There, alone, with no one to lay hands on me and no one to pressure me, I spoke in tongues again. It still felt like it was me doing the talking, but it flowed more freely, and this time I let go more than I had earlier in the evening. Although it didn’t seem that anything properly miraculous was happening, I felt uplifted in my mind to a place of deep and personal closeness with God. Babbling like this had had a curious cathartic effect: it emptied my mind of rational thought, making room for sheer emotion and the raw sensation of transcendence. It was a mystical experience, rather like that sought by Buddhists. Of course, I didn’t make that connection at the time. At the time I only knew that at long last I had been filled with the Holy Spirit. 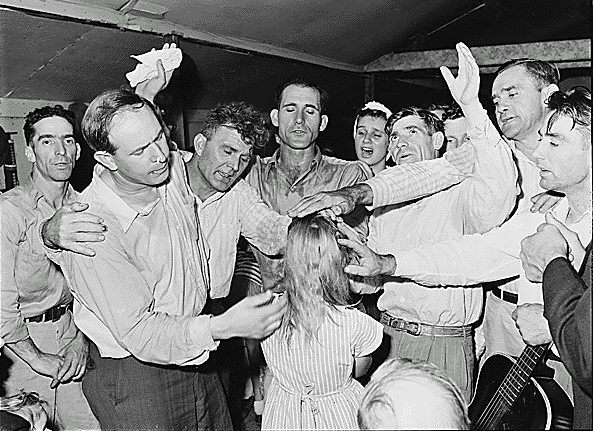 I now consider my adolescent Pentecostal belief in a miraculous gift of tongues to have been naïve, but the practice itself is not as silly as it sounds to non-Pentecostal ears. As with so many religious rituals and ideas, speaking in tongues is rationally absurd but experientially and symbolically powerful. Pentecostal theologian Frank Macchia has written that tongues symbolizes that “language cannot follow one into the depths of the encounter between the mystery of God and the mystery of the self before God.” He also adds that “It is the lowest common denominator between people who might be very different from one another, revealing a deep sense of equality that cannot be denied and that challenges any discrimination based on gender, class, or race.” I am speaking from experience when I say that I think that that’s true. I no longer speak in tongues, because it doesn’t make much sense to me to do so without the literal belief or the communal solidarity that I learned to associate with it. But I remember fondly the unity I felt with strangers as we harmonized together in nonsense song more meaningful than any lyrics. And I find myself, from time to time, wishing for a new ritual through which to have the same experience. J. W. Gunnison, The Mormons, or, Latter-day Saints, in the Valley of the Great Salt Lake: A History of Their Rise and Progress, Peculiar Doctrines, Present Condition, and Prospects, Derived from Personal Observation, during a Residence among Them (Philadelphia: Lippincott, Grambo, 1852), 53, https://archive.org/details/mormons00gunngoog (accessed April 6, 2016). This entry was posted in History, Personal Narrative by Christopher Smith. Bookmark the permalink. Thus resonates a lot with me, Chris. You just basically described my own youthful experience, as well as my own developing understand of what it meant, and the unique place it had – absolutely beautifully. I spent a lot of time on my mission trying to make sense of what I had seen as an authentic spiritual experience in my other tradition, and how I could reconcile it with changing ideas about religion and expressions of religious enthusiasm. This is great. Thanks for sharing, Chris. This sounds very much like self hypnosis Chris. It’s not unlike standing in front of a mirror saying positive things to oneself which is a technique recommended by psychologists. Our brains certainly can provide the comfort and reassurance we need if we know how to do it; I did it often as a Mormon especially in the temple while trying to ‘feel’ what others claimed to feel. Thank you so much for sharing this experience; it helps to unravel the mysteries of faith. I’m interested in the claim of your church to “have restored the gift of tongues to the world in 1906 at the Azusa Street Revival.” I have long thought that the early Mormons’ gift of tongues was in line with what other Protestant churches were doing at the time. Am I mistaken? Or was your church just unaware that glossolalia was fairly common in nineteenth century America? It was mostly just the Shakers and Irvingites doing it in the 1830s, Cheryl. So interesting! I had no idea the Mormons were so much in the forefront of this practice. My first experience was in an LDS Fast and Testimony meeting. It was an ecstatic experience with shouts of “Praise Jesus” coming from the audience. It lasted about 5 minutes. I was crying with joy the whole time. I was the first and last speaker. It was the shortest F&T meeting in the history of the church. When later, I was asked that an interpreter should interpret. I pointed to Sister Cox, and said,”I thought that you would interpret”. She screamed, “I knew it, I knew it”. After the meeting, the Bishop said to me, “In 35 years as a bishop and SP, I have never seen or heard of this, before”. I know I’m late to the conversation, but I love that you shared this experience, Chris. It happened to me twice that I wound up in a similar situation where someone tried to get me to speak in tongues. Once was with the New Testament Church of Christ in Graham, Washington (Google them; they are mighty cult-y). I had expressed interest in the gift and felt conflicted and confused by those who say you aren’t even saved if you can’t do it. I went to the altar to pray for it to happen and had all kinds of people babbling in tongues around me, praying for me. I felt nothing happening though and refused to be fake, so tongues didn’t happen that night. The second time happened at a Kenneth Hagin rally. Hagin was in town preaching faith-healing and I had brought my severely autistic brother to him to be healed. He preached at everyone about God’s power to heal for hours and then bee-lined backstage as soon as he was done. I went to his staffers and said I had a very sick boy here whom I had brought in to be healed. They suddenly looked super-worried. “Um, I don’t think Kenneth is seeing anyone tonight.” I burst out crying (I was 18 and had come a long way to see Hagin) and one of the staffers said that my problem was that I needed to “stop feeling sorry for myself.” Ah, blameshifting. Anyhow, they had asked at some point in the meeting two questions: people who wanted to get saved and accept Jesus that night, and people who had never spoken in tongues before who wanted to be filled with the Spirit. I raised my hand for the second group. You can imagine my surprise when they herded me into the same room as the people-getting-saved and began urging me to pray to accept Christ. I didn’t realize that these were people who thought, if you haven’t spoken in tongues, you aren’t saved. But, I once again found myself in a situation where I was surrounded by people babbling in tongues around me and urging me to pray to be filled with the Spirit. I knew that if I tried it, it would be me being fake, so I got out of there. I joined the Assembly of God years later, while studying at BYU in Provo. It is a requirement of AoG membership that you speak in tongues. My pastor looked the other way and I was always welcome. My brother is still severely autistic. Fascinating stories, Jack! Thanks for sharing! Inspiring. I see a koan in here somewhere. Thank you. That does not fit the “missionary work only” model that some LDS have taught in the recent past. But it does serve as an item of interest for our Pentecostal/Evangelical friends. History of the Church (the 7 volume plus index, version), volume 1, page 297, has the first recorded incidence of the gift of tongues in the restored church, bestowed twice upon Brigham Young during prayer meetings, and confirmed as genuine by Joseph Smith.